"Hi, my name's Hugo - or at least that was the name they gave me at Battersea Dogs Home and that is the name I am still called by my pets Clive, Elaine and the little, mischievous one; Peter. I was released from Battersea on good behaviour earlier this year (22nd January 2001), after having served my time of approximately two weeks. I don't remember much about my previous pets - I seem to have lost them and, while I was looking for them the Battersea lot found me wandering around & interned me. I now live with my new pets in sunny Hounslow, where there is a great place called Hounslow Heath - definitely worth a visit if you are in the area. We have a nice big back garden and I go to a brilliant social club once a week at the First Whitton Scout HQ - called Capable Canines." 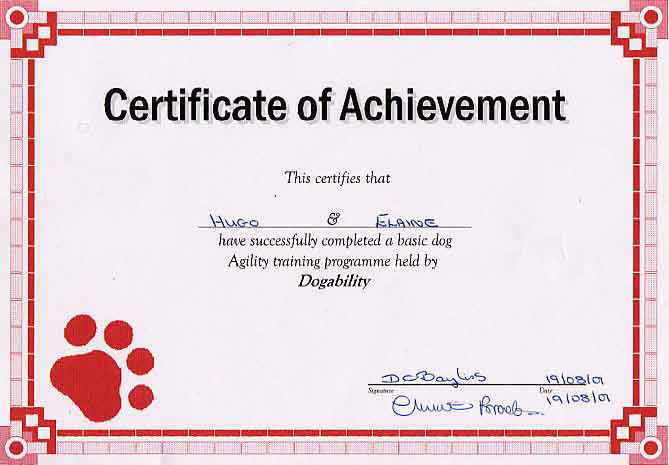 "I have been doing my agility training and have just completed my basic agility training with Capable Canines. Elaine did help me a bit. It was great fun jumping over the jumps. I really liked going through the tunnel. I didn't really like the weave poles though. 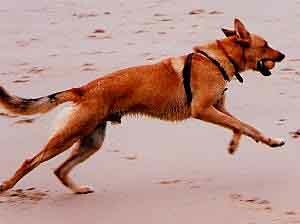 It would have been much more fun to have been able to run around with the other dogs." "Casper is my special friend. 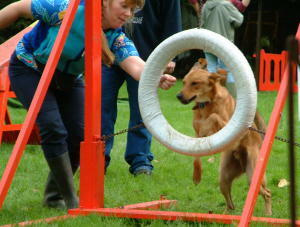 We did manage to get away and have a run a few times and we were all allowed to have a play on my last day. " 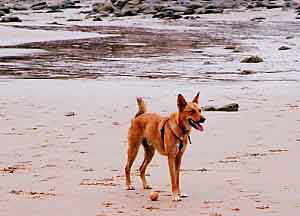 "I recently went on holiday with my pets to Tenby; it was great ! There were some brilliant walks through woody paths, plenty of other dogs to sniff at & I got to have a good bark at the other campers if they strayed too close to our tent. The best thing, though, was this incredible place with a sort of wide flat yellow soil, littered with rocks & little, interesting to sniff at, pools, going down to masses of foaming salty water; really great for running about on and splashing about in ! I enjoyed going to Caldey Island, but I wasn't too sure about the wobbly wooden thing we travelled in on the way there & back".